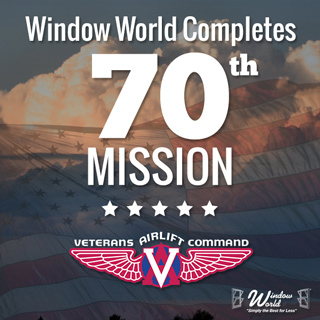 WASHINGTON, D.C. — Window World ®, America’s largest replacement window and home remodeling company, completed its 70th Veterans Airlift Command (VAC) mission Tuesday, September 30, 2014. Following their participation in this past Saturday’s Capital Region Tough Mudder 2014 in Gerrardstown, WV, Window World flew 7th Special Forces Group MSG Jared “Red” Bullock, Army Ranger PFC Kyle Emmons and MSG Troy Konvicka home to San Antonio, Texas. The VAC provides free air transportation to post-9/11 combat wounded soldiers and their families through a national network of volunteer aircraft owners and pilots. For many wounded warriors with prosthetics or other mobility issues, flying in private aircraft rather than commercial planes is the best way to accommodate their unique needs. Window World has been a partner with the VAC organization for over five years. The Capital Region Tough Mudder, designed to test participants’ teamwork, stamina and all-around strength, was one of the more than 100 Tough Mudder races held nationwide since 2010. To date, these events have raised $6.5 million for the Wounded Warriors Project. Despite multiple injuries sustained fighting overseas in the fall of 2013, Emmons and Bullock, aided by Konvicka, completed the grueling 10-to-12-mile course, highlighting their determination and skills. Window World ®, headquartered in North Wilkesboro, N.C., is America’s largest replacement window and home remodeling company with more than 200 locally owned and operated offices nationwide. Founded in 1995, the company sells and installs windows, siding, doors and other exterior products. To date, Window World has sold over 10 million windows. For the second consecutive year, Window World ranked “Highest in Customer Satisfaction with Windows and Doors” by J.D. Power. Window World is an ENERGY STAR ® partner and its window products have earned the Good Housekeeping Seal for seven consecutive years. Window World, Inc. supports the Veterans Airlift Command (VAC), a non-profit organization that facilitates free air transportation to wounded warriors, veterans and their families for medical and other compassionate purposes. All flights are made available through a national network of volunteer aircraft owners and pilots. To learn more about the VAC, visit www.veteransairlift.org. © 2019 Window World of Houston. All rights reserved.